There is no better place than Lanzarote for learning to fly ! The island offers launches for every wind direction, all reachable in less than one hour, and we have launch sites adaped to all skills. 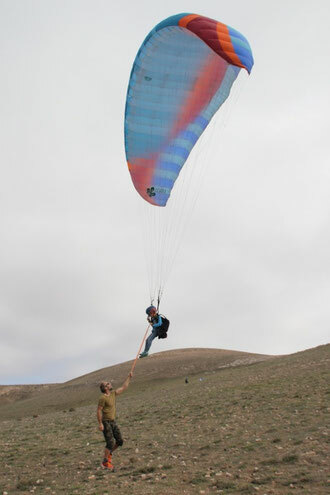 After learning the theory and how to handle your wing, you start with small hops on a gentle slope and will fly from small hills within two or three days. At the end of the training, you will be able to complete independent flights with up to 600m height difference. 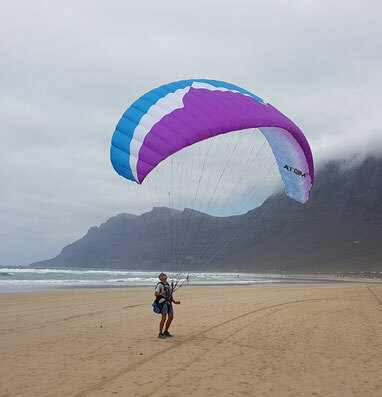 Intro session : consists of a tandem flight and a 2h session on the beach, where you can see how you feel and learn how to steer a paraglider. 5 more sessions of +/- 3 hours each, where you learn to take off safely and fly solo. If you want to go further, we also offer advanced courses and can provide all the information on how to become a licensed pilot. We are so proud of Illia, 8 years old, who successfully did his first take off in solo !